Show your customers some love with heart die cut postcards. These 4” x 6” cards feature a perforated heart design that makes them stand out among other promotional mailings. 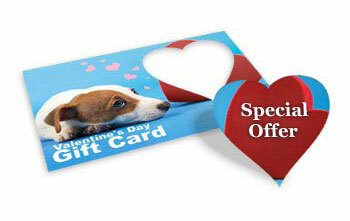 Heart cards are great for Valentine’s Day marketing or they can be used as romantic gift cards any time of year. The pop out heart on these unique die cuts can be used to write in a custom gift card amount redeemable at your business; use the back for a signature. Heart cards come printed on durable 14pt ultra-thick cardstock and you have the option to use full color on both sides. Complete the look with either a glossy UV coating or a matte finish. Valentine’s Day and the days leading up to it are big days for many businesses; make yours one of them with heart die cut postcards. These unique die cuts are perfect for a Valentine’s Day marketing campaign. The perforated heart pops out of the card, making them suitable as coupon mailers or gift tags. All you have to do is place your discount offer or gift claim on top of the die cut heart. For placement examples, take a look at our template gallery. You can browse for ideas, or customize one of our free designs to suit your business. Although you will need to plan ahead in order to maximize customer response, if you find yourself running short on time, don’t worry. Next Day Flyers offers two quick turnaround times, including 3 day and next business day turnaround when your print-ready files are in before 10 am Pacific Time. If you have extra time, you might consider writing a note by hand on the cards. A personal touch is especially appropriate for Valentine’s Day, which is all about intimacy. Plus, it usually brings a higher response rate!